2013-14 UPPER DECK THE CUP CAM NEELY SCRIPTED STICKS AUTOGRAPH CARD AUTO /35! The card is in at least nr-mint/mint condition and the autograph (certified by Upper Deck on the back of the card) is hard signed right on the stick piece. The card also contains a. The card is numbered 20/35! 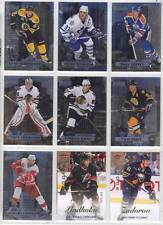 2013-14 Upper Deck The Cup Hockey. Serial Number In Title. All cards are in NR Mint/Mint Condition unless otherwise stated. CENTERING IS BETTER THAN THE SCAN SHOWS ON THIS HOCKEY CARD. NEAR MINT OR BETTER CONDITION.